Party skiffs and yachts light up Tokyo Bay under the Rainbow Bridge. 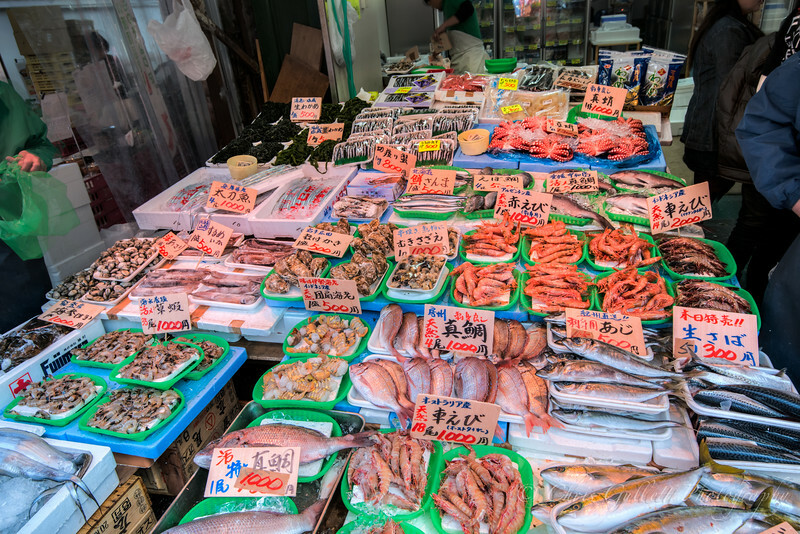 The Tokyo skyline shimmers in the distance. 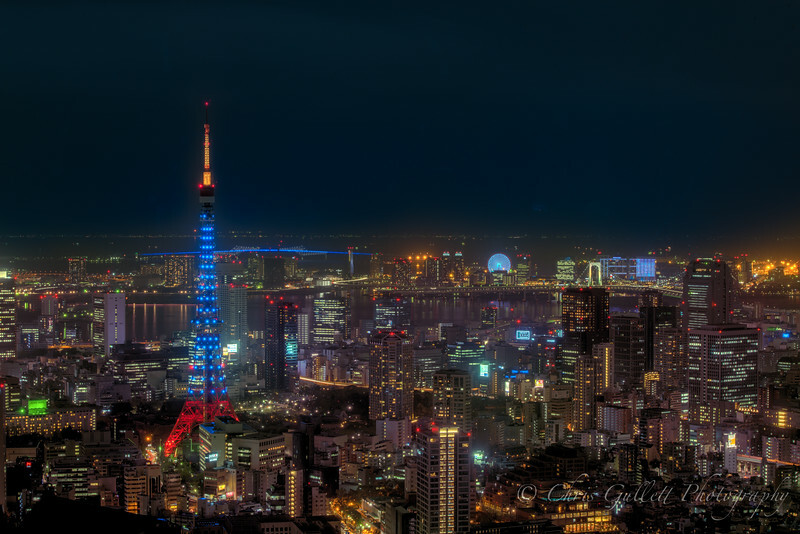 The electric fires of Tokyo shine in this nocturnal skyline shot. Tokyo tower (which changes color periodically) blazes orange tonight, and sets low hanging clouds ablaze with its orange glow. Taillights of the unending traffic resemble a river of lava in this time lapse shot. Daihatsu ferris wheel, the Rainbow Bridge and Tokyo bay are visible on distant right horizon. 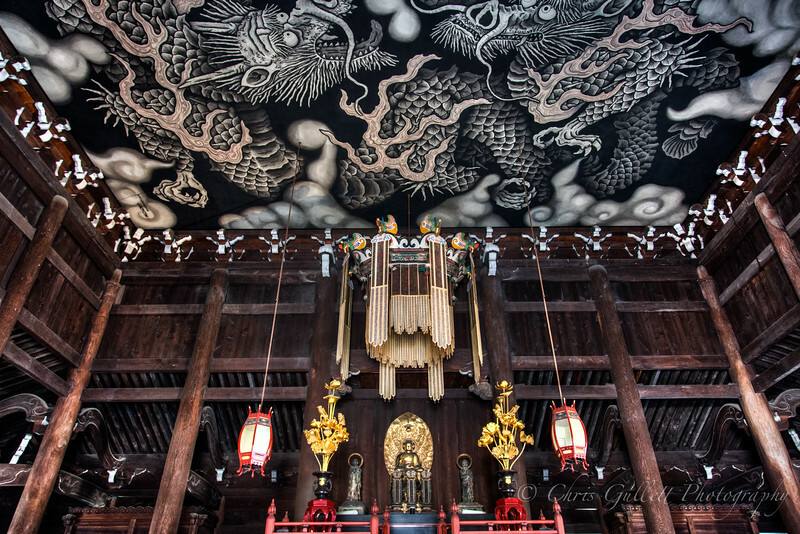 The profound serenity and beauty of this quite temple hidden in the bustle of Kyoto is difficult to put into words. 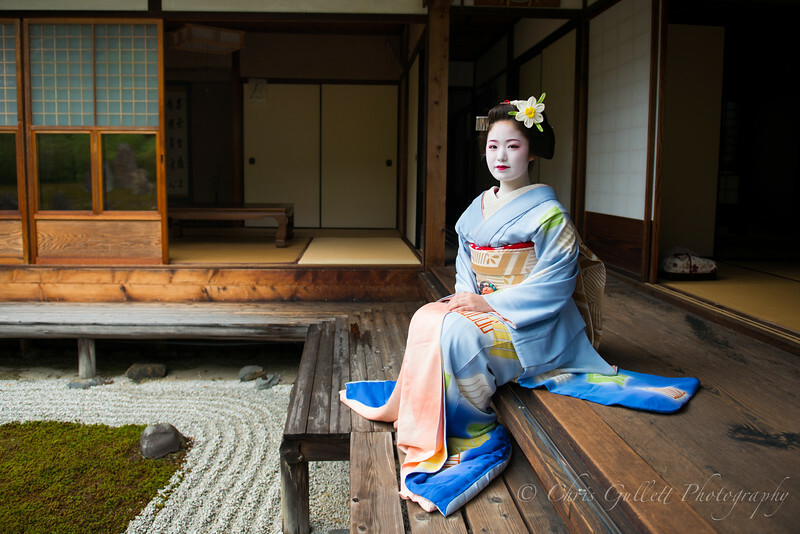 The vibrant floral blue of this elegant geisha absolutely blooms amid the quiet earth tones of the moss and rock garden and smooth wooden planks of the temple. 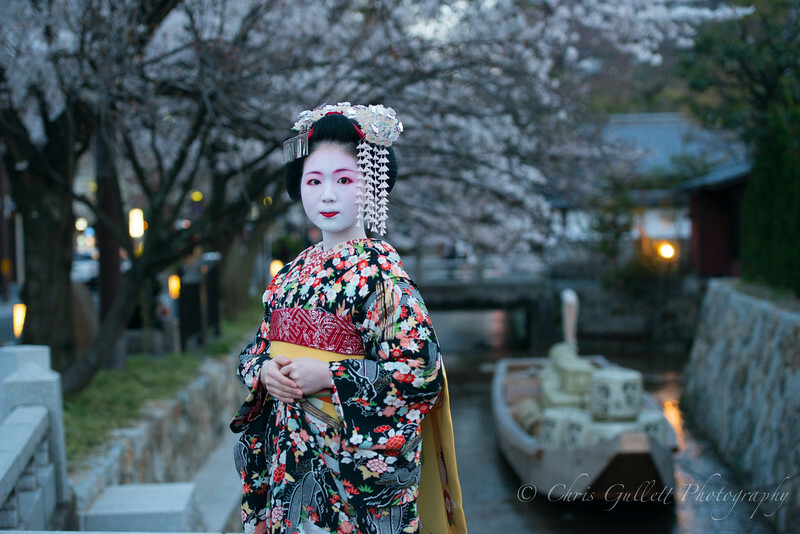 As evening descends and the street lanterns ignite, this Maiko of Kyoto stops on a bridge under overhanging cherry blossoms. Note the skiff in the canal behind her. 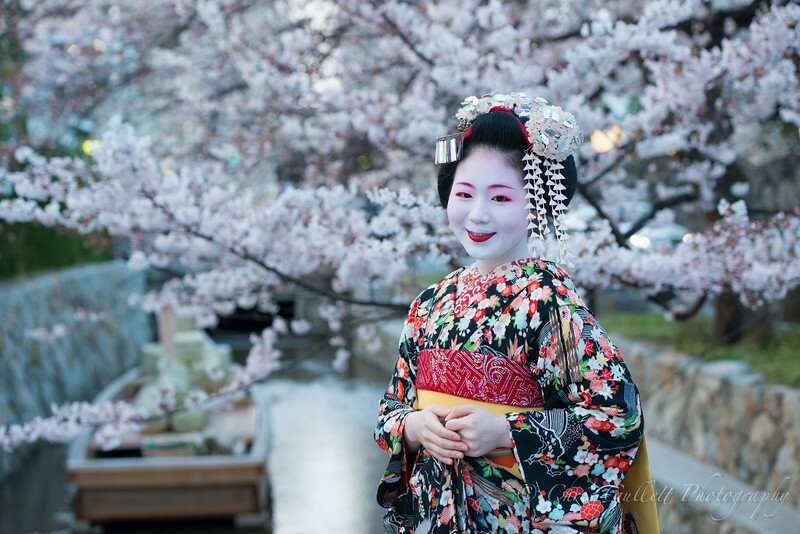 Note also how the Maiko (a younger Geisha) matches her makeup and kimono to the seasonal cherry blossoms. 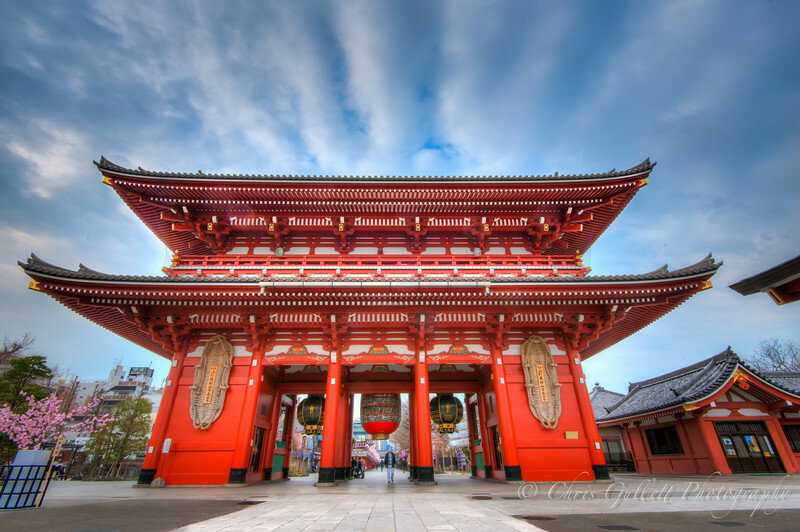 The Kaminarimon or "Thunder Gate" is the entrance to Senso-ji Temple, the oldest temple in Tokyo. It was founded in 645 C.E. 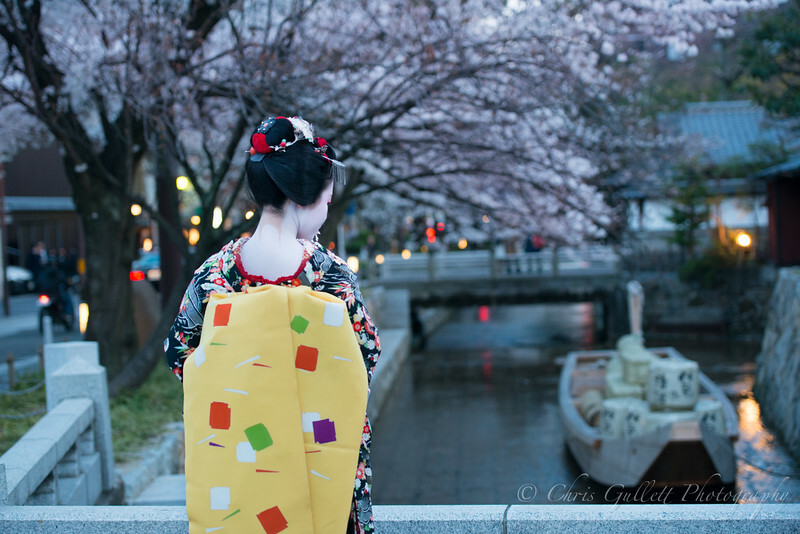 Maiko (younger Geisha) are discouraged from smiling and laughing; this beautiful and genuine smile on a canal under the cherry blossoms is a rare gift to us. 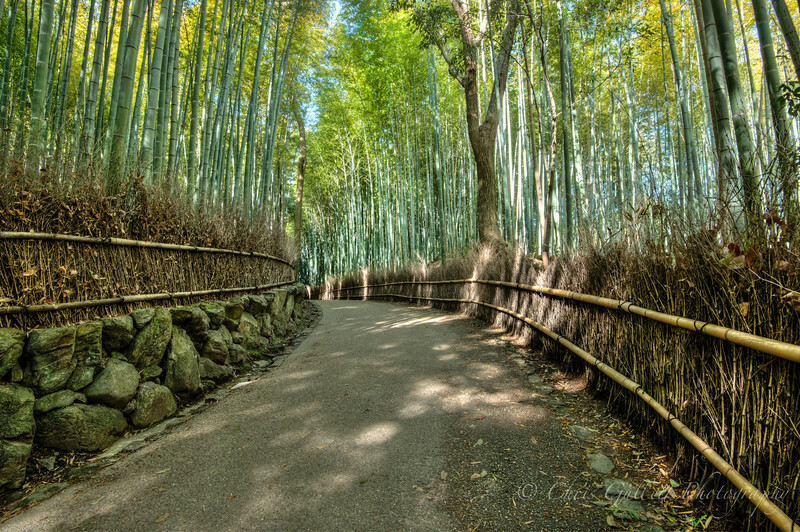 Dappled morning sunlight decorates this serene path through a majestic forrest of Bamboo and moss covered rocks. Kennin-ji was built in 1202 and is Kyoto's eldest Zen temple. 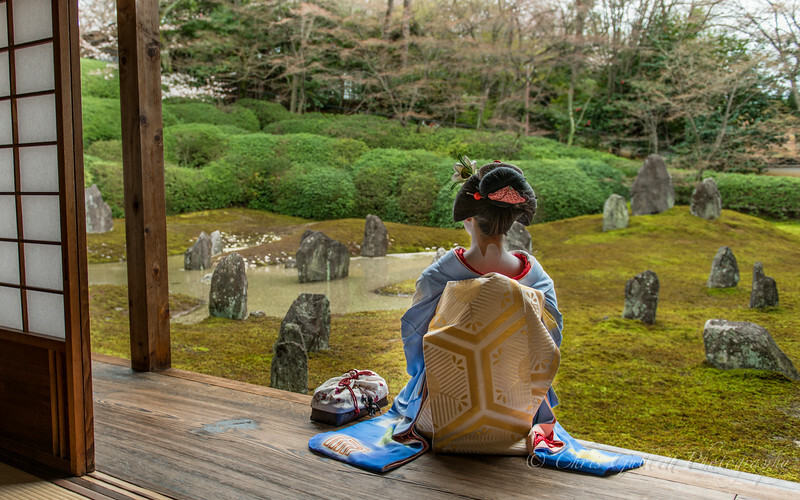 This zen garden is one of the most beautiful in Japan. 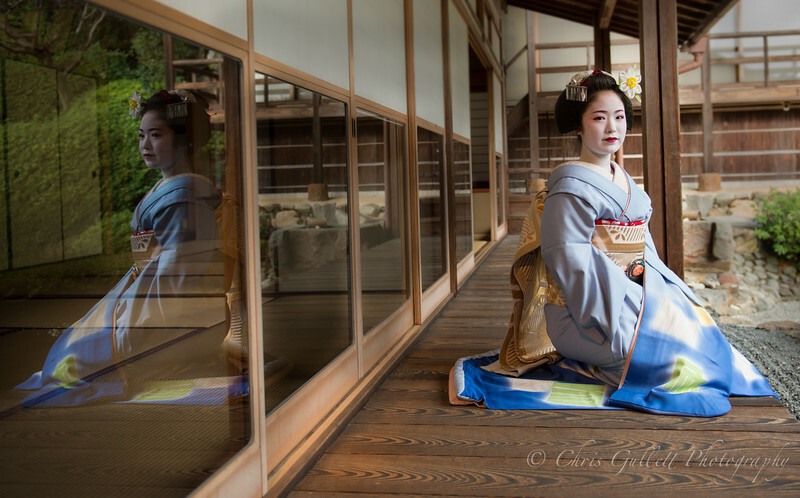 I love the ghostly reflection of this Geisha. 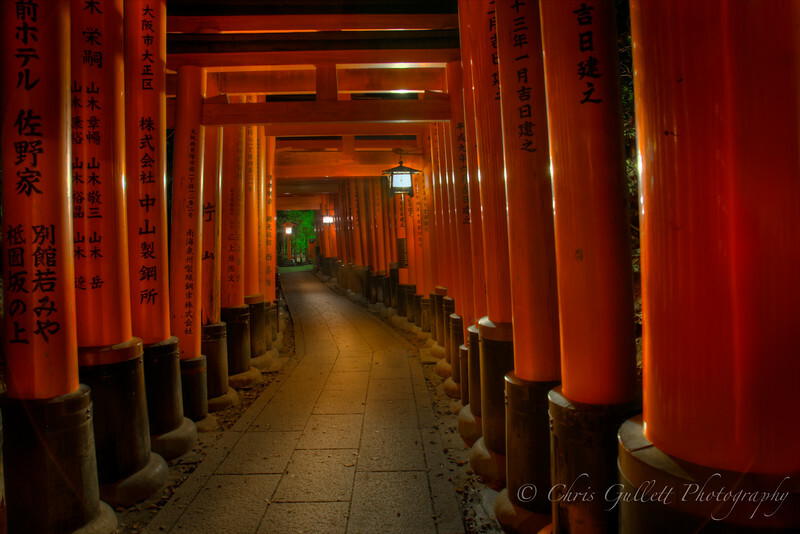 The Tori gates at Fushimi Inari Shrine, form a 4 km path up Inari Mountain. 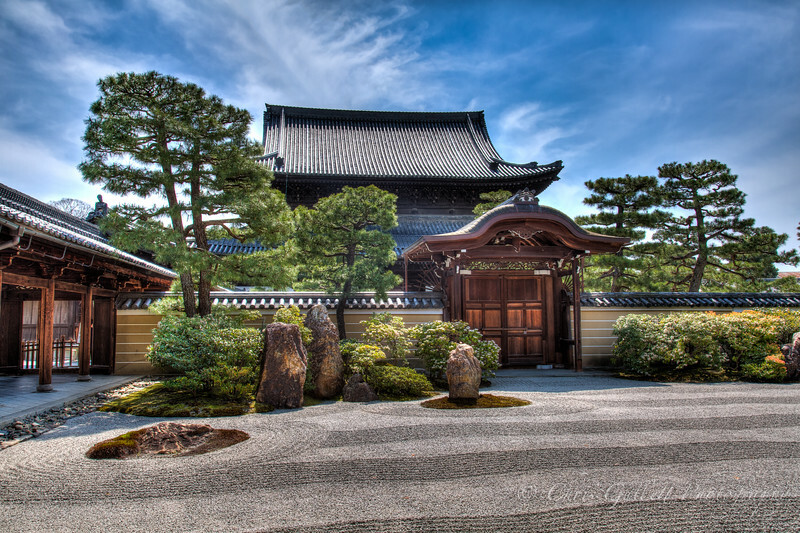 Passing through the gates loosely represents passing from a material to a more spiritual world, and similar, though less elaborate, gates are often found at the thresholds of other temples. This photo really has a sense of a spiritual path, framed by the other worldly gates, traced by the lighting on the path and series of lanterns, and emerging into the inviting green world beyond. 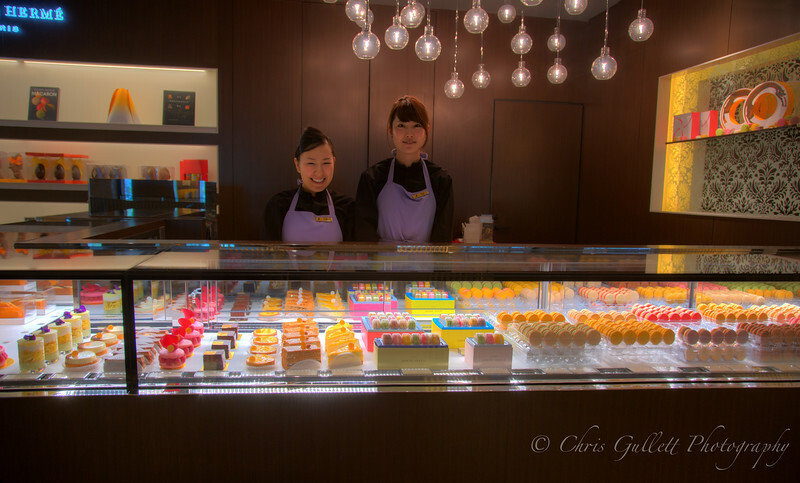 The Hermes sweet shop in Kyoto. 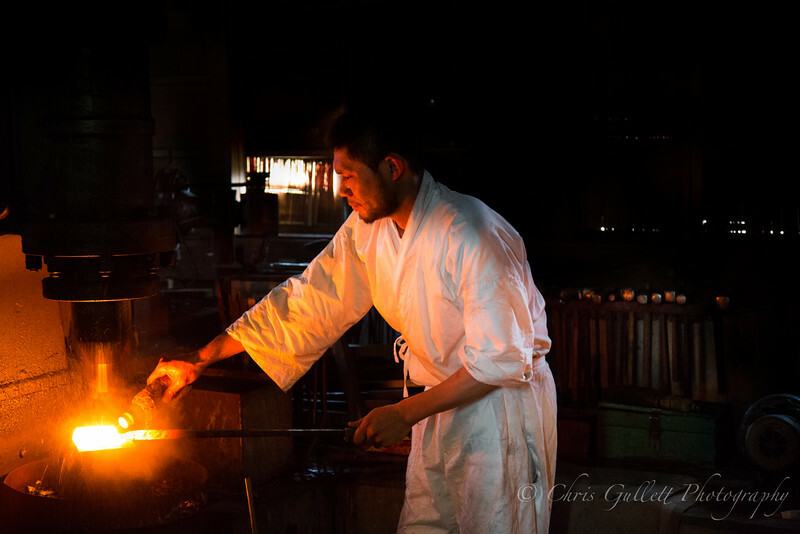 Traditional Japanese sword smiths keep the lighting in the forge dim and constant so that they can judge the temperature of the steel by the intensity and color of the metal's glow. She was beautiful, just beautiful. 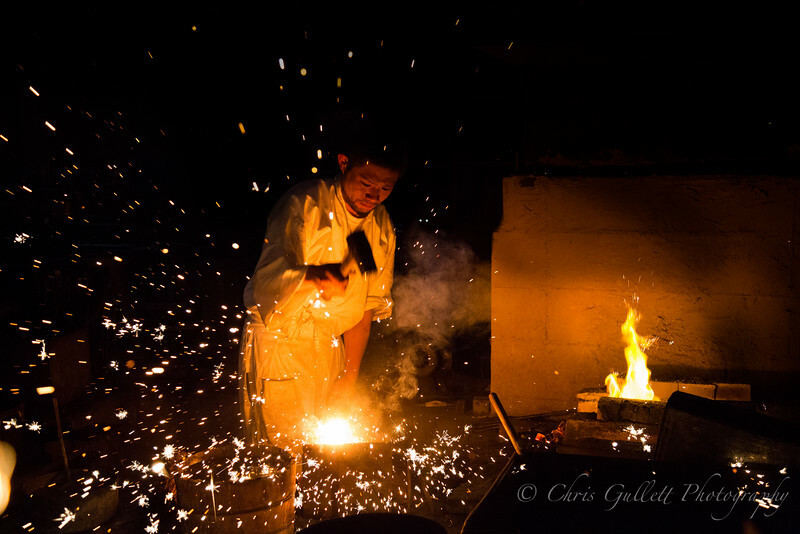 The dichotomy of the Japanese business culture is difficult for westerners to comprehend. 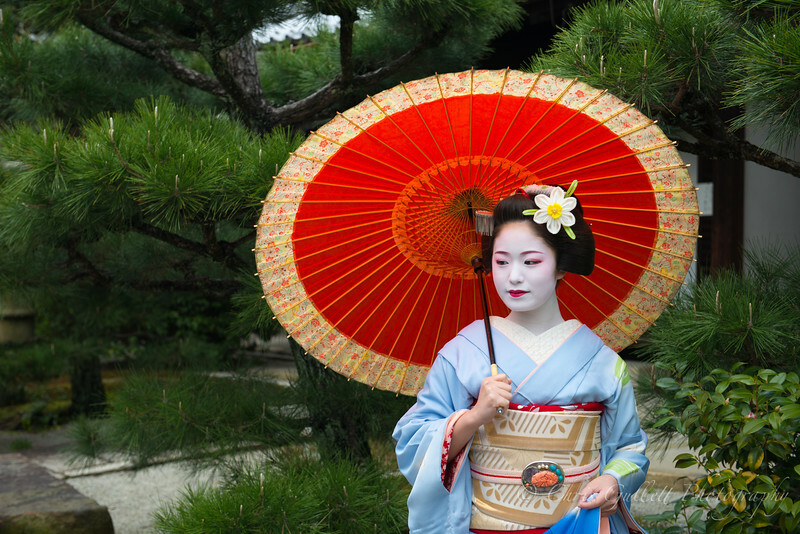 During the daylight, business interactions are formal, ridged, and ceremonial. 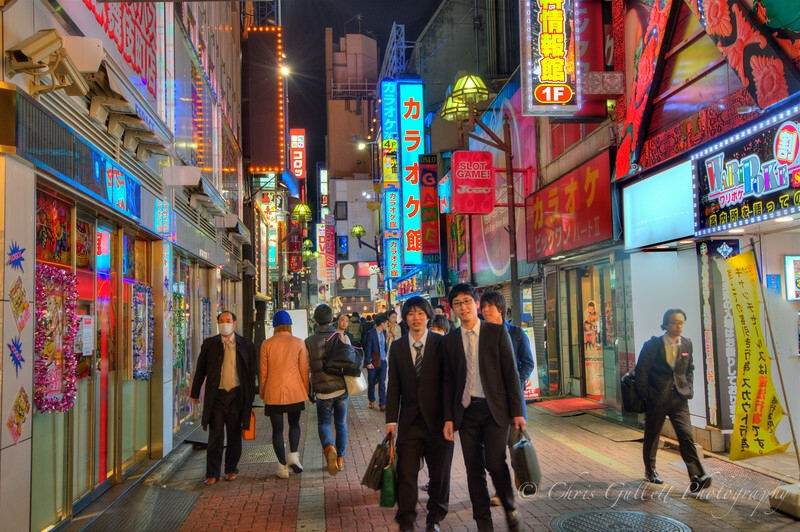 As night falls on the electric city however, the alleys echo with karaoke songs serenaded by businessmen in 3 piece suits who stagger home while laughing freely with loosened ties. 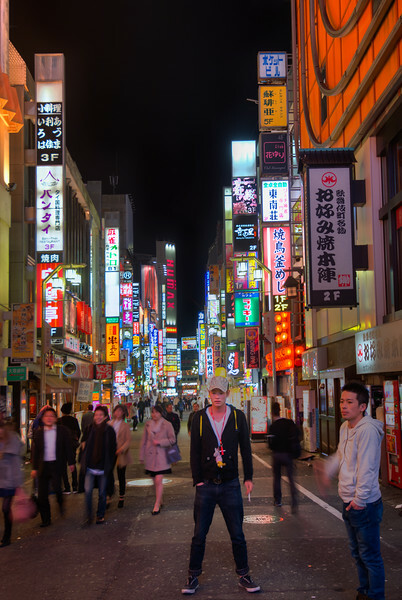 In an entertainment district of Tokyo these shady, characters solicit ??? 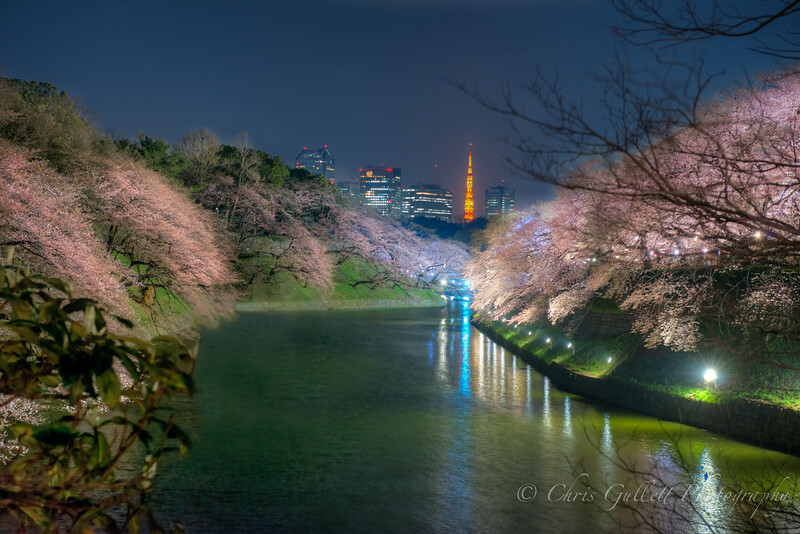 The moats surrounding the Imperial castle are lined with cherry trees and lit at night. 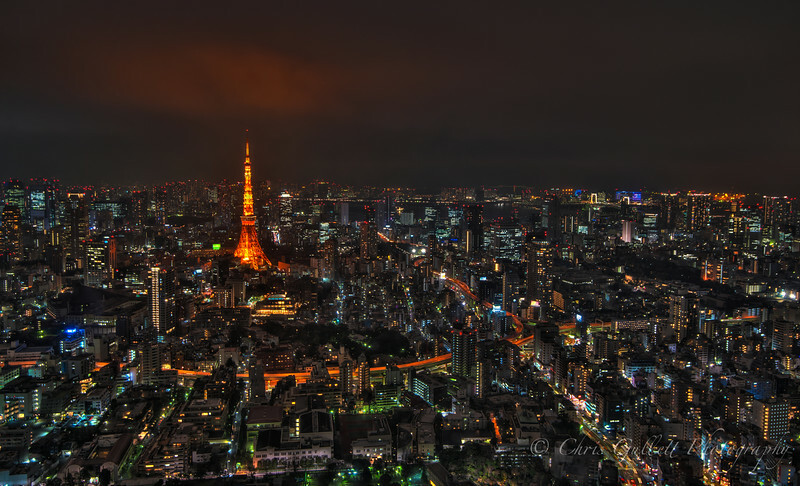 Tokyo tower glows orange in the background. 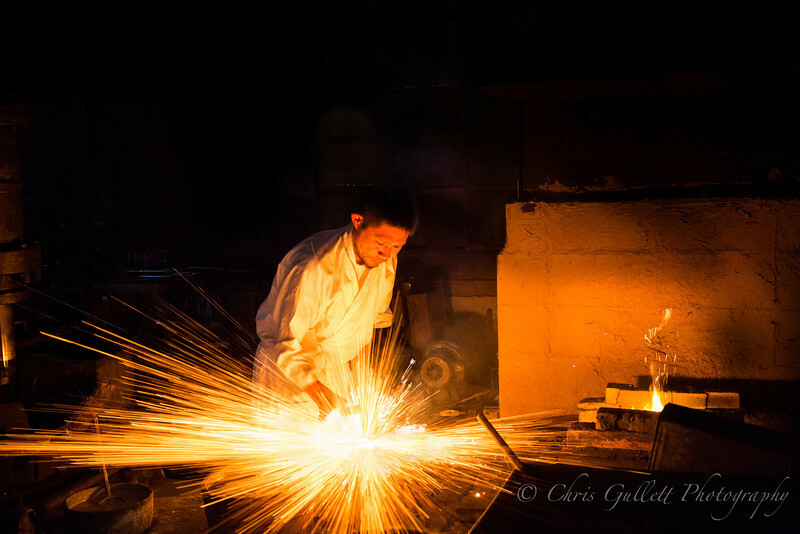 This difficult shot is a HDR composite several long exposures in low light. 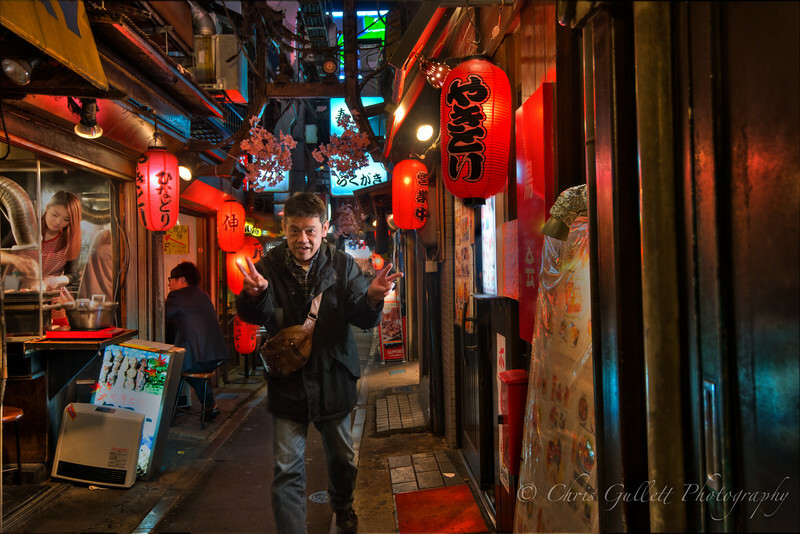 Alleys like this are common in the less touristy areas of Tokyo and are are a large part of the authentic Tokyo nightlife. Note the train rail system curving over the alley. 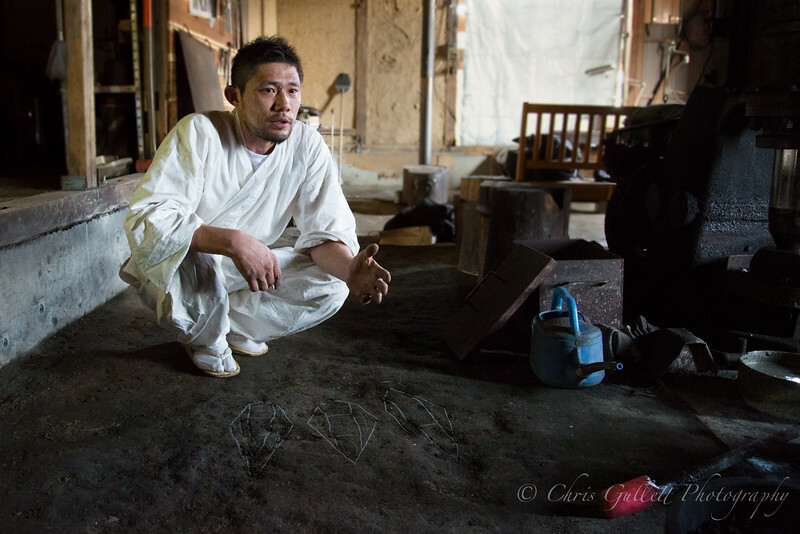 A local gives me the ubiquitous Japanese peace sign in a Tokyo alley. 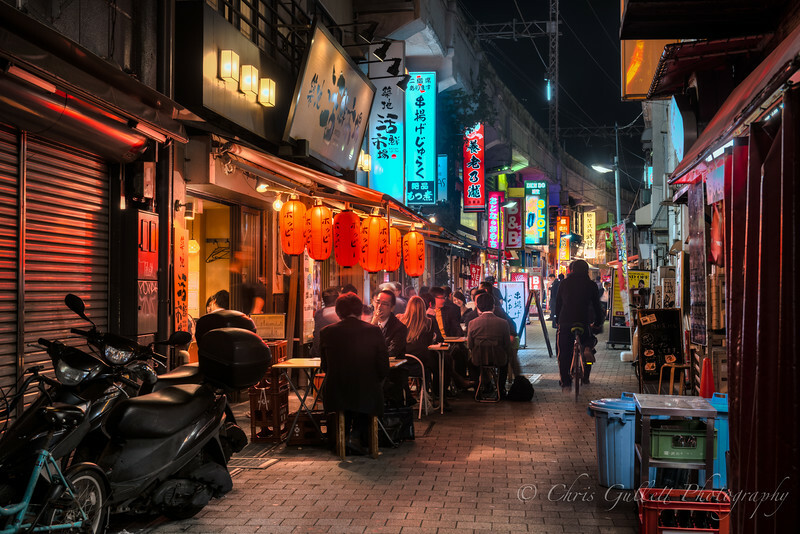 These alleys are densely packed with small business, bars and kitchens. Note the lovely girl cooking to the right and the single chair diner behind her. 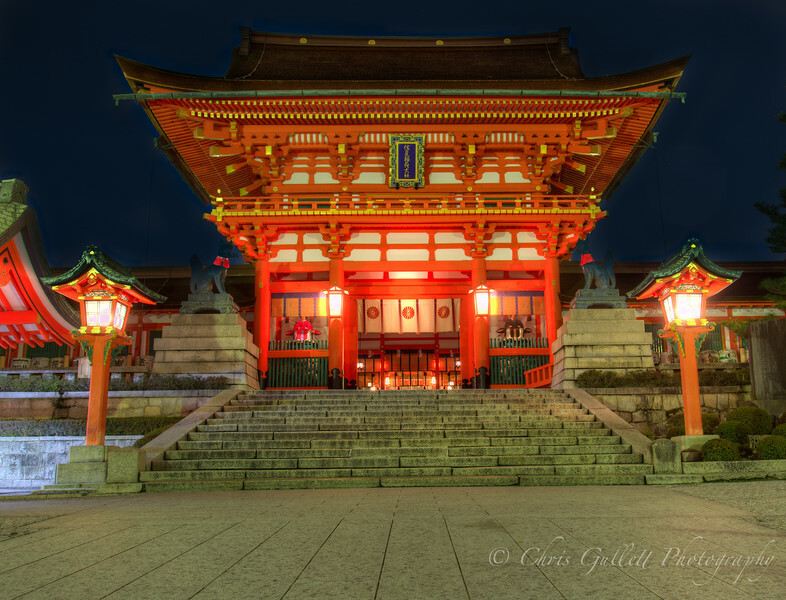 Fushimi Inari Shrine, founded 711 C.E., is a shinto shrine to the god of rice. This is the entrance to the 4 kilometer hike up Inari mountain through the famous Tori Gates. 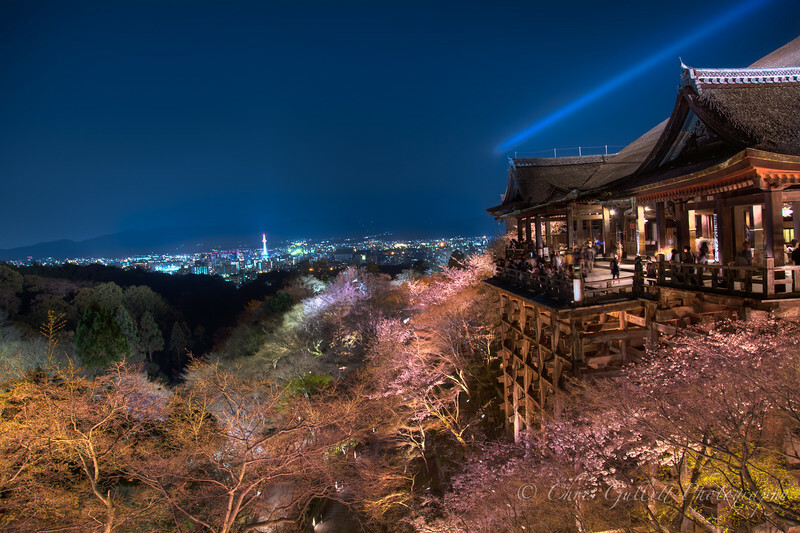 Kiyomizu-dera is an unspeakably stunning Buddhist temple founded in 798 in Kyoto. 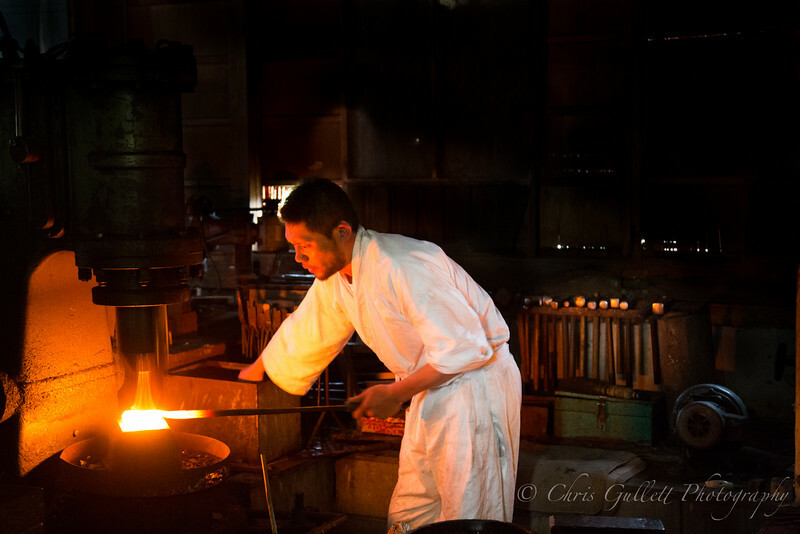 It is perched on a Mountainside overlooking the sparkling town of Kyoto below. 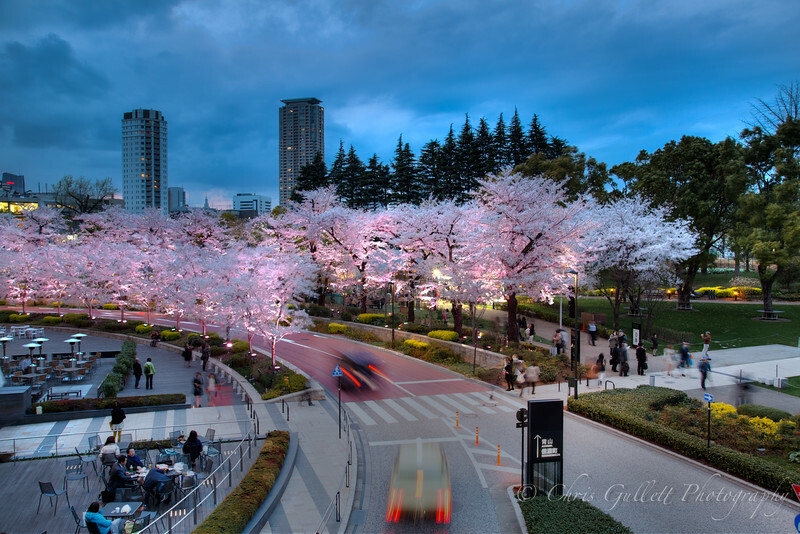 A spotlight beam streaks across the sky above and right, while the early cherry blossoms begin to emerge below. Legend states that if you jump from the balcony seen in the photo, and survive, the rest of your life will be blessed and lucky. 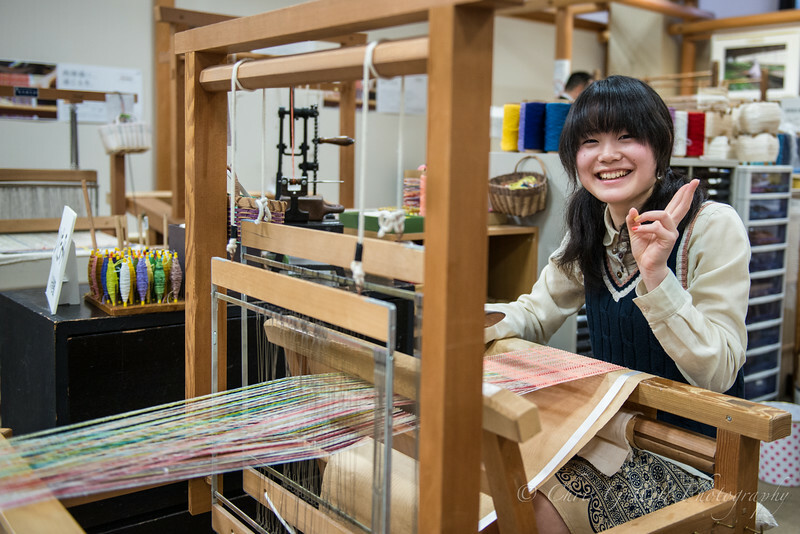 A local girl with a beautiful smile weaves on a traditional loom in a Kimono factory. Tourist come from all over Asia to see the cherry blossoms. 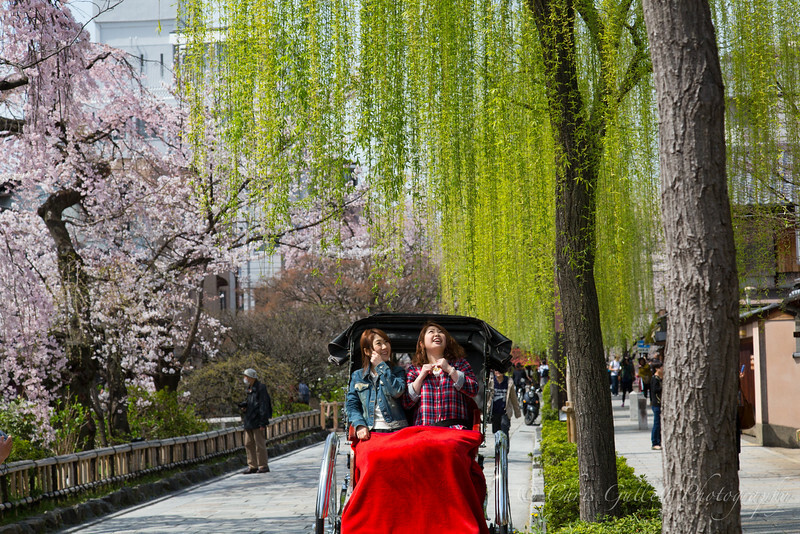 These charming girls laugh with glee under the willow and cherry trees. The very meaning of "Zen" resides in this photo. This is a closer shot of Tokyo tower with its blue lights afire. Daikanransha ferris wheel (the worlds second largest after the London Eye) spins away on the horizon to the right. The Rainbow suspension bridge over Tokyo Bay is also visible to the right. 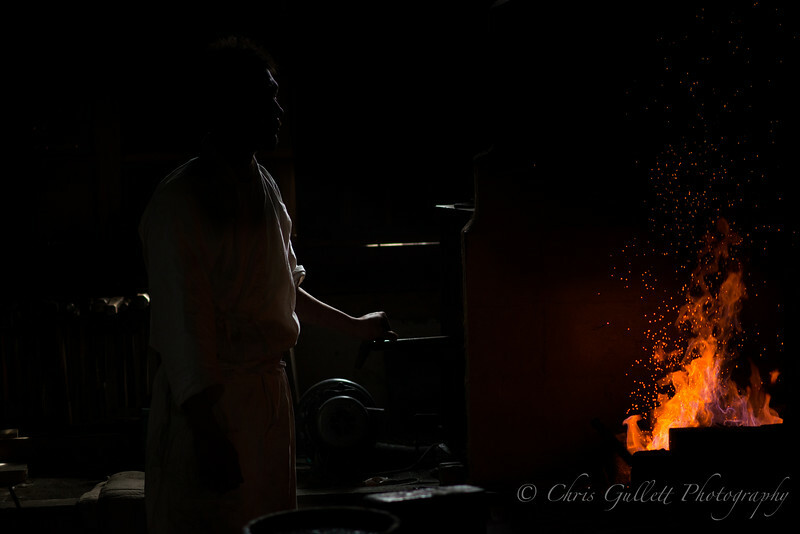 This gentleman is one of a few rare traditional master Japanese sword smiths. 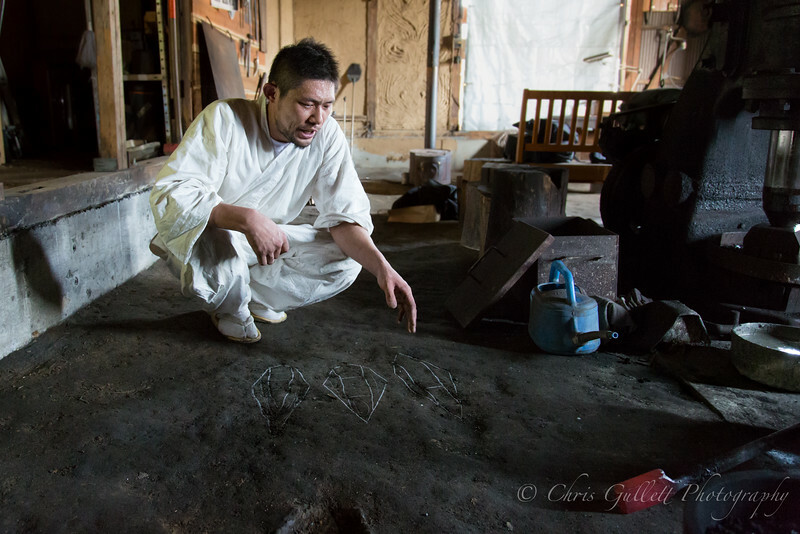 He is a 25th generation smith, and legacy of the Kanefusa family tradition. 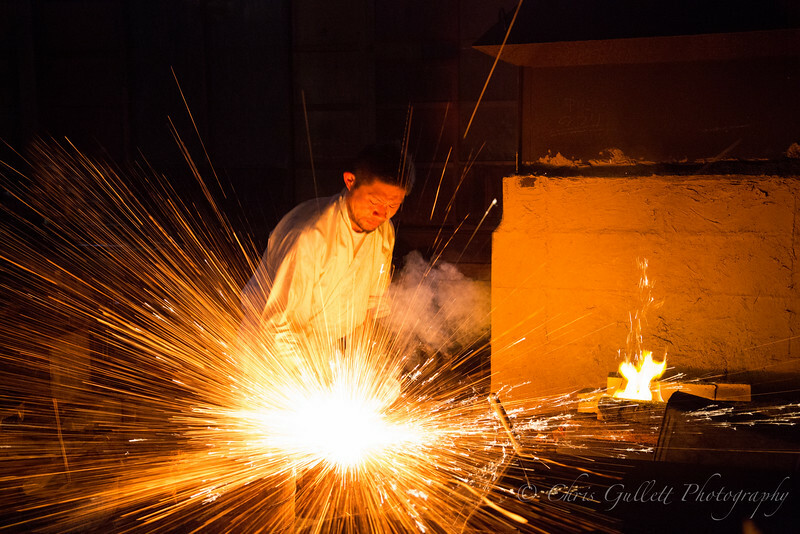 His swords command extremely high prices, and are coveted by CEOs of large Japanese companies, very serious collectors and practitioners of Japanese martial arts.